Everyone should have a space this pretty. As promised, I completed my project and I am THRILLED. The small things really are wonderful. Last Monday, I showed off two awesome rugs I bought from Urban Outfitters. 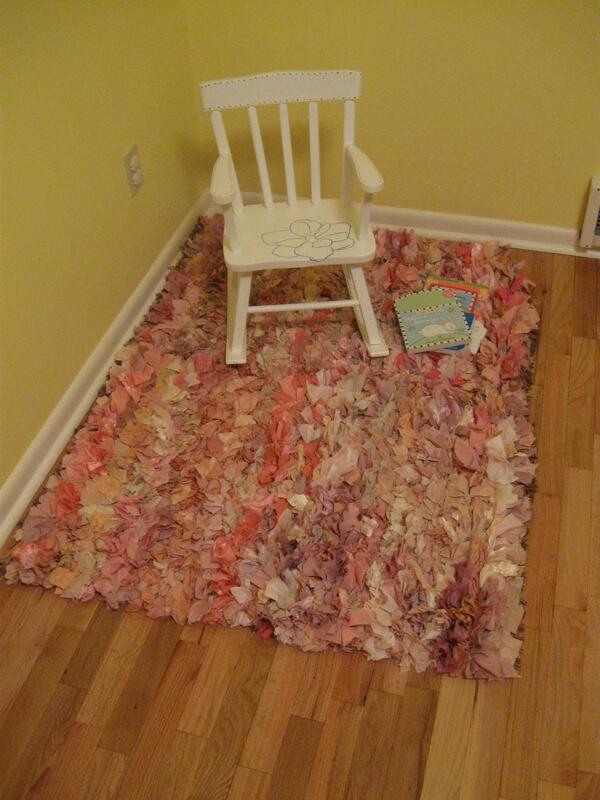 I wanted to attach them to create one good area rug for Little Lady. It was really simple — big needle and heavy thread. If you have never sewn together two shag rugs, it’s really not as bad as it sounds. The loose raggy top means that you don’t have to worry about exposed stitching ever being seen. I just held the two finished edges together while keeping them flat and used a whipstitch. I did make a very tight double knot every few inches. Since this is going into a toddler room, it has better stand up to some abuse. I originally did want to put it under her play table, which is waiting to be stained. After putting it down on the floor, I don’t think it would be big enough anyway. But it is perfect for a new reading corner! My Aunt gave Little Lady a rocking chair right after she was born. Smart lady that she is, she left it white so I could decorate it however I wish. Thanks Aunt J! I can’t remember what other project I had been doing, but I had leftover blue and green acrylic paint already mixed. When I take the time to mix an awesome color, I want to use every drop. 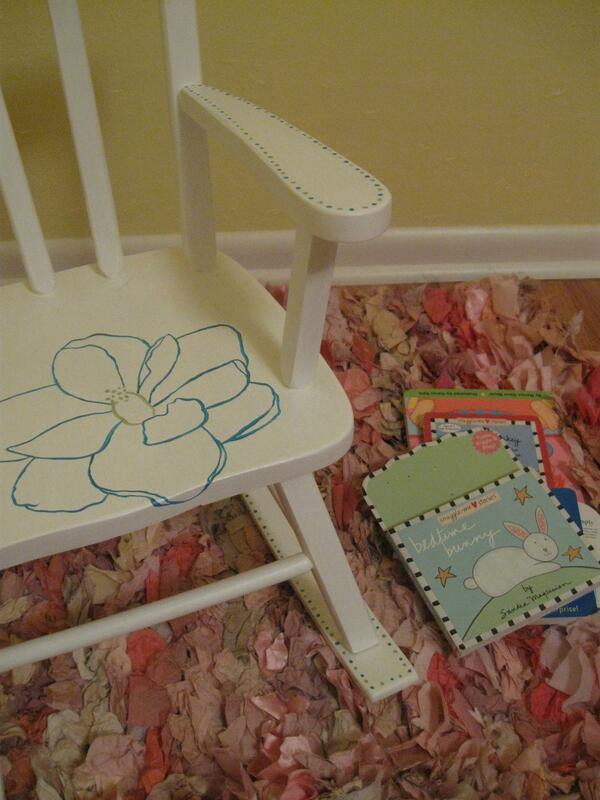 Anyway, I ended up staying up until nearly midnight to decorate this little chair. I was wiped out for work the next day, but it was totally worth it. And now a sweet chair meets a fluffy rug for a match made in heaven. Add a little stack of books, and we have a spot made for reading. I was so excited after completing the rug that I snuck into Little Lady’s room when she was sleeping to quietly rearrange. But the best compliment came the next day. I put her down on the floor, and she headed right for the rug. She sat down in the middle of the rug and started twirling her fingers through it. Nothing gives me crafting motivation like baby oooohs and aaaahs. So week one of Start Small is a success. Hopefully it created some small amount of inspiration for you. Check back tomorrow to see what the next small project will be.